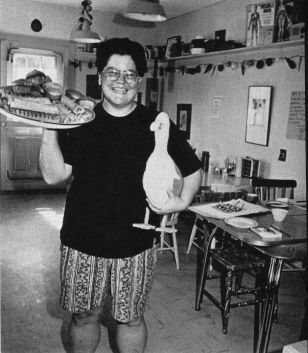 JaneKansas' queer restaurant in Head of St Margaret's, 1991 - 1992. How was it queer? Well, first of all it was campy. What should have been a dish rail a foot from the ceiling all around, was littered with every toy you ever had, plus every one you ever wanted. Another queer element was a bulletin board covered with postcards from Debbie - from all over the world. Debbie had obviously gone on a very extended vacation and left Jane in charge. The food was fantastic - good, solid, home-cooked food and tasty, healthful bread, and tasty pastries to stog your arteries right afterwards. maybe a pic or two, maybe a menu. Also - interview question - what was it like having a GayBusiness? out in the boonies?